Magnetosphere: the region of space surrounding an astronomical object in which charged particles are controlled by that object's magnetic field. The magnetic field near the surface of many astronomical objects resembles that of a dipole. The field lines farther away from the surface can be significantly distorted by the flow of electrically conducting plasma emitted from a nearby star. Planets with a magnetosphere, like Earth, are capable of mitigating or blocking the effects of cosmic radiation. 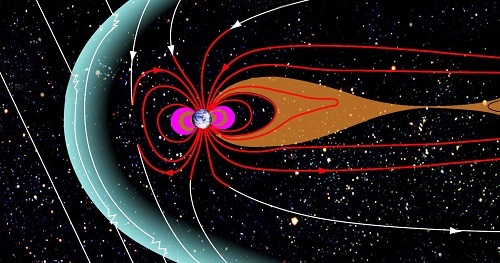 The structure and behavior of magnetospheres are dependent on several variables: the type of astronomical object, the nature of sources of plasma and momentum, the period of the object's spin, the nature of the axis about which the object spins, the axis of the magnetic dipole, and the magnitude and direction of the flow of solar wind. Can The Northern Lights Lead To A Global Catastrophe? Is Colonizing Mars Actually a Good Idea? Did a Solar Storm Damage Earth's Magnetic Field? Will Martian Astronauts Have to Battle With Dementia?